The current social web trends are really changing the way we do things. 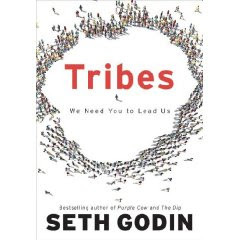 Seth Godin - the author that is always looking to change the way we think about life in general and marketing in specific - is starting his own "tribe" to promote his new book, Tribes: We Need You to Lead Us. Membership is only being promoted through his blog. With Seth's track record, I think this is one "tribe" that I want to be a part of. Sign me up or should I say "What right of passage will get me in the tribe"?